A 12.75-foot oarfish, a rare deep sea fish, has been washed up on the beach of Barangay Maradiona, Belison, Antique on Thursday afternoon, August 13. This is the third sighting of an oarfish in the province in just three weeks. The oarfish that was caught in Belison measured 12 feet, 9 inches. On July 23, an 8-foot oarfish was caught by a fisherman off the coast of Tobias Fornier. 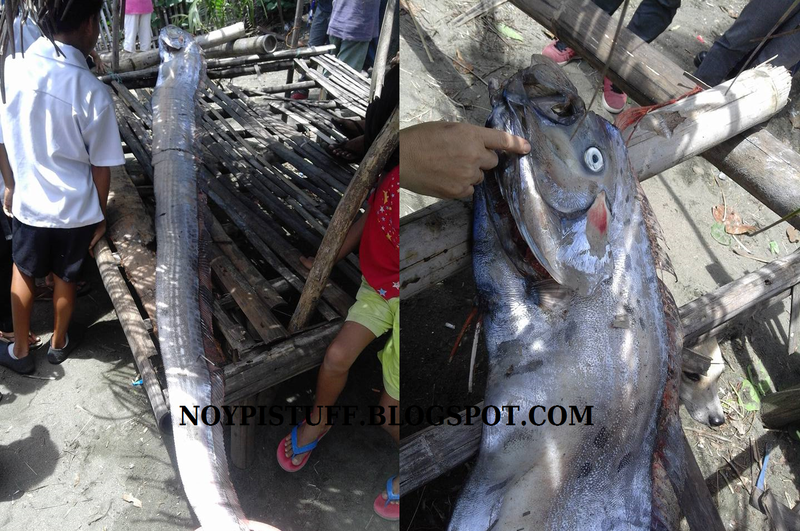 The second oarfish, which measured 11 feet, was captured through a fishing net in Laua-an on July 28. Oarfish is known as the "Messenger from the Sea God's Palace" in Japan. According to Japanese folklore, oarfish rising to water surface may signal a coming earthquake. A Japanese scientist had said that there could be some scientific basis to this story. "Deep-sea fish living near the sea bottom are more sensitive to the movements of active faults than those near the surface of the sea," Kiyoshi Wadatsumi, who studies earthquakes at the nonprofit organization e-PISCO, told the Japan Times. Aware of the Japanese superstitious belief, the governor of Antique voiced out her worries regarding the appearance of the bottom dwelling organism in the province. "I am beginning to worry why these things are happening," Governor Rhodora J. Cadiao said in an interview with Panay News. "I pray that earthquakes connected to these fishes remain a myth, but the waste-dumping of the government near our seas could be a possible cause of the appearance of this fishes since it is being done in the deep areas of the ocean where, as they say, these fishes thrive," she added.